It’s a big weekend and not much of a let down thereafter! Modern and experimental music comes in a big dose this weekend with the Dave King for Two Days extravaganza at the Walker. Seven projects associated with King, including two brand new bands, are showcased: The Bad Plus, Happy Apple, and combined Bad Apple, along with free improv band Buffalo Collision kickoff on Friday night (3/12), followed by the newly constituted Golden Valley Is Now and Dave King Trucking Company on Saturday night (3/13), bookending a reconfigured Gang Font. That means that for two nights, some of the most creative improvisors in the world converge on Minneapolis—Ethan Iverson and Reid Anderson with the Bad Plus, Michael Lewis and Erik Fratzke with Happy Apple, Tim Bern, Hank Roberts and Iverson with Buffalo Collision; Craig Taborn and Anderson with Golden Valley Is Now; Chris Speed, Adam Linz and Fraztke with Trucking Company; Greg Norton, Fratzke, and Bryan Nichols with Gang Font. And oh yeah, every band features Dave King on percussion. Less dissonance, more swing can be found Saturday night when the Laura Caviani Trio with Gordy Johnson and Phil Hey take the stage at St. Barnabus Church in Plymouth as part of the Jazz @ St. Barney’s series, and at the Hopkins Center for the Arts with the Ristroms (guitarist Reuben, vocalists Diane and Dan) and songbird Lee Engele present “Jazz American Style.” Meanwhile Jeremy Walker’s Small City Trio plays Late Night at the Dakota on Friday (3/12) and Patty Peterson brings her polished pizzazz to the Dakota for prime time Saturday night. Sunday (3/14) is not a slow night either, with Jazz at Lincoln Center returning to Orchestra Hall, featuring a new extended work by saxophonist Ted Nash; and in St. Paul, Pavel Janey and Ticket to Brasil warm up the night with a CD release at the Artists Quarter. 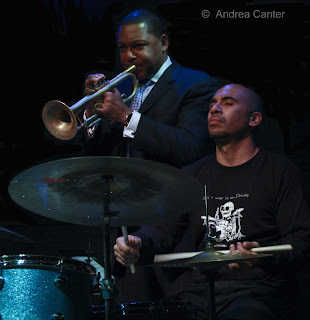 More global trends emerge early in the week, with Regina Carter’s Reverse Thread ensemble at Ted Mann on Monday night (3/15), preceded by a live interview with Northrop director Ben Johnson and Bebopified/MinnPost writer and jazz hound Pamela Espeland. Reverse Thread features African kora player Yocouba Sissoko. 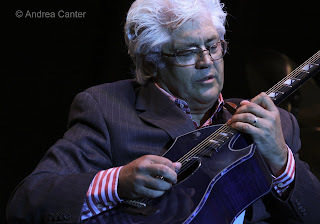 For the following two nights at the Dakota (3/16-17), the fusion is Indian when guitar legend Larry Coryell brings his Bombay Jazz Project to town, featuring world saxman George Brooks and two of India’s star artists, Ronu Mojumdar on flute (bansuri) and Aditya Kalyanpur on tablas. Two local songstresses have weekly gigs this month, both on Thursdays --Maud Hixson at Erte in northeast Minneapolis and Nichola Miller at Spoon River in the Arts District. More singers are featured Thursday (3/18) when the Jazz Vocalists of Minnesota present an all-star showcase at Hell’s Kitchen, with Lucia Newell, Vicky Mountain, Rhonda Laurie, Dorothy Doring, Lee Engele and Gregg Marquardt, and relative newcomers Barbara Bjork, Maxine Souse and Jackie Moen. 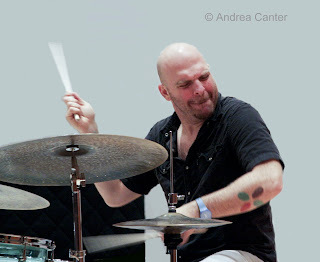 The Phil Aaron Trio will ensure a swinging evening. Thursday (3/18) also marks the Schubert Club’s celebration of Bach’s 325th birthday, with a party at the Dakota featuring cellist Matt Haimovitz and the avant Jello Slave. As an improviser himself, no doubt Johann Sebastian would find this evening intriguing. Coming soon—JazzMN Big Band with Fred Sturm (3/20), Pooch’s Playhouse at the AQ (3/21), an open master class and performance by Israeli pianist Anat Fort at MacPhail (3/21), Arturo Sandoval at the Dakota (3/22-23). There’s a lot more of course, so check out the Twin Cities calendar at http://www.bebopified.blogspot.com/ .